Praised for the aesthetic quality and technical excellence of its models, Corum is proud to perpetuate the values and expertise of fine watchmaking while continuing to look toward the future by creating the watches of tomorrow, today. Founded in 1955 in La Chau-de-Fonds, Switzerland, Corum has made creativity and daring its guiding principles. The brand continues along the path mapped out by its founders and remains truer than ever to the iconic collections responsible for its identity and reputation, while enhancing them with a touch of modernity that combines innovation and cutting-edge technology. The Admiral’s Cup has been sailing the seas for more than 50 years, while the Bridge model has brought light to the watchmaking world for 35 years. Several models in the Heritage collection, such as the Coin Watch, have left an enduring mark on watchmaking. Meanwhile, the standards of the Bubble models are modernity and creativity—when fine watchmaking becomes legendary. As a newer watchmaking marque founded in the mid-20th century, Corum has never been rigidly bound to conforming to design expectations. From the architecturally inspired Golden Bridge to the playful Bubble, virtually every Corum is a statement. 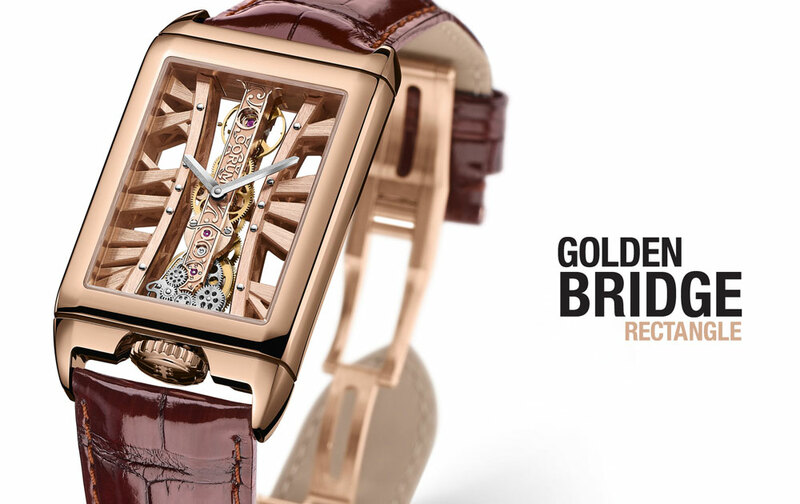 The Golden Bridge is the iconic timepiece of Corum since 1980. It features the first and only in-line baguette movement on the market. The Golden Bridge, in its many versions is innovative and unique. Shown here in the rectangle version of the timepiece, you can see the architectural features of a microstructure representing the Golden Gate Bridge inside the art deco style case. The pinnacle of Corum’s collection, the Golden Bridge in its many versions is innovative and unique. Its uncommon caliber is sheathed in sapphire crystal, allowing the skill of the watchmaker to be fully appreciated from every angle in select versions of the watch design. 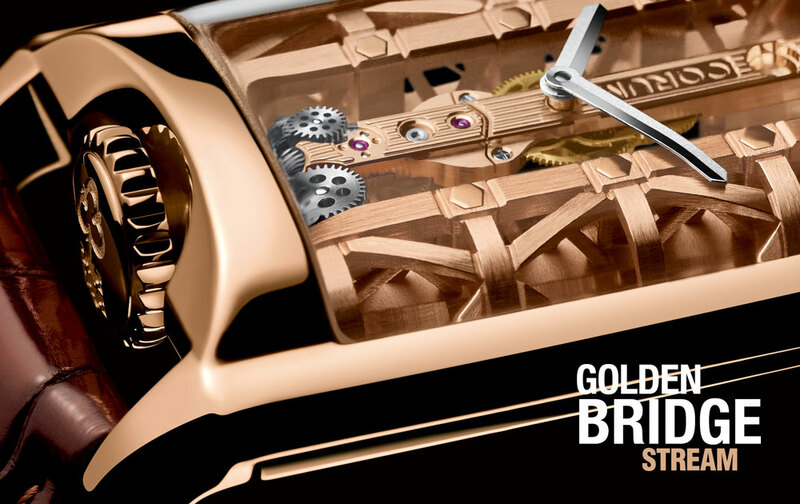 The unique Golden Bridge movement has been cased in many exceptional variations, case shapes, and materials. 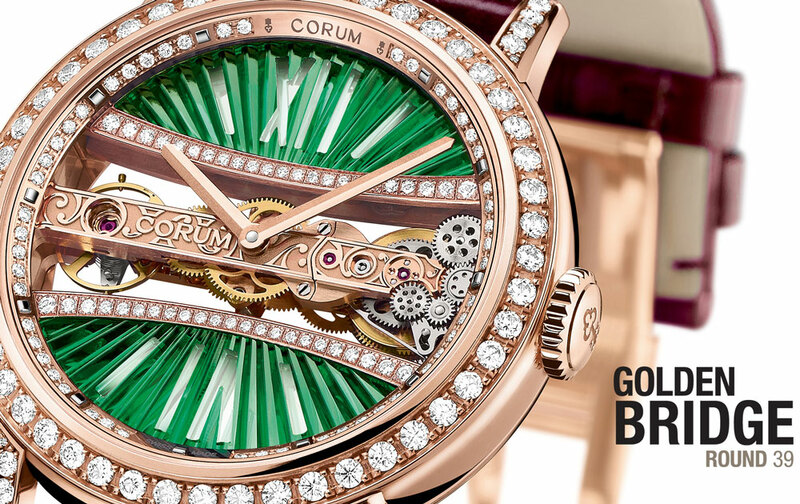 Corum revisited the round bridge and created a colorful series with natural resin elements and housed within a gold micro structure “cage” set with diamonds and handcrafted embellishment. Praised for the aesthetic quality and technical excellence of its models, Corum is proud to perpetuate the values and expertise of fine watchmaking while continuing to look toward the future by creating the watches of tomorrow, today. 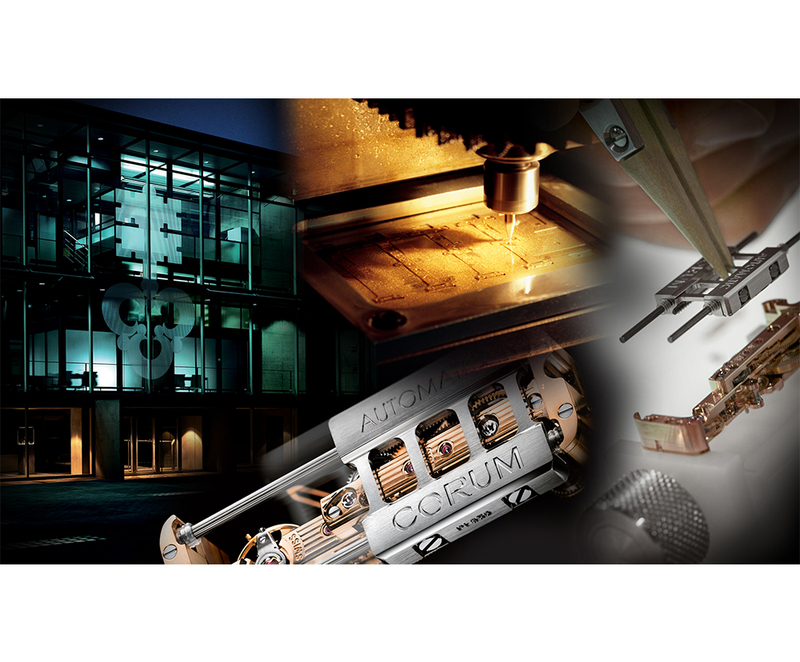 Founded in 1955 in La Chau-de-Fonds, Switzerland, Corum has made creativity and daring its guiding principles. The brand continues along the path mapped out by its founders and remains truer than ever to the iconic collections responsible for its identity and reputation, while enhancing them with a touch of modernity that combines innovation and cutting-edge technology. The Admiral’s Cup has been sailing the seas for more than 50 years, while the Bridge model has brought light to the watchmaking world for 35 years. Several models in the Heritage collection, such as the Coin Watch, have left an enduring mark on watchmaking. Meanwhile, the standards of the Bubble models are modernity and creativity—when fine watchmaking becomes legendary.